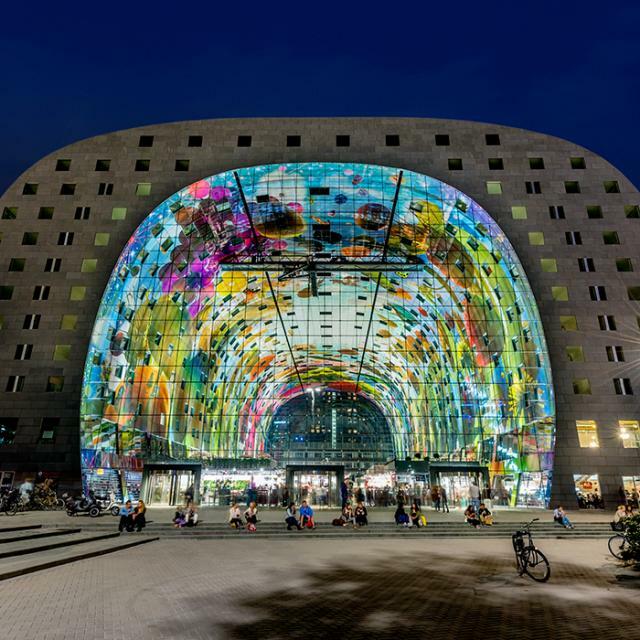 You’ve done the research – revolving doors will save your company significantly on its energy bills, allow you to regain interior floor space, and help you stand out from the rest of the buildings on the block. Your research also tells you that the door should last decades past the purchase date. And it will, if you don’t overlook one critical item during installation: the flooring. 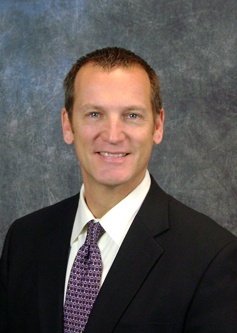 I have over 30 years of experience in the revolving door business and I’ve seen time and again how neglecting the flooring can come back to bite – maybe not instantly – but definitely years down the road. Let’s explore why a level floor is necessary and when a floor frame might be required during installation. Installing a revolving door on top of a completely level floor is essential to a long product life. Think about it: a door rotating on an unleveled floor will put undue stress on the door wings and the door operator. The wear and tear will be excessive, and your door will have to be replaced sooner than expected. Shimming is a popular method for trying to square a door on an unleveled floor. While this method is useful, if done in an excessive manner you’re setting your project up for failure over time. The shims will eventually force the door out of balance and plum. The result? A door that is hard to push and is excessively loud, producing a rubbing and squeaking noise. Not ideal in an upscale lobby. I often hear from contractors that there is absolutely no way to pour a dead level floor. If a tolerance is required, we recommend no greater than 1/8 inch. Revolving door installers should check to ensure the floor meets these standards before they begin laying the framework for the door. 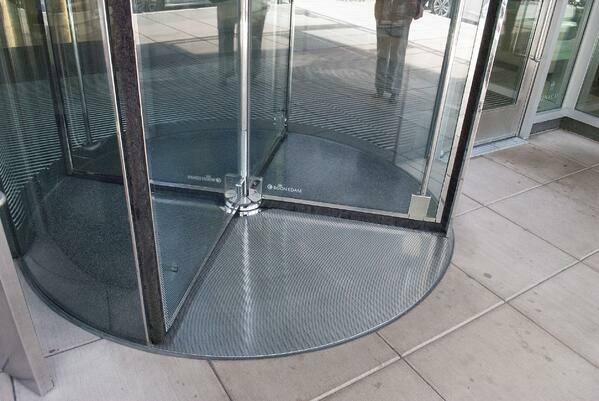 Boon Edam revolving doors are designed to sit right on a level, finished floor. But, there are some cases where a floor frame (or sometimes called a “matwell ring”) is necessary for smooth door operation and/or aesthetic requirements. What is a floor frame? 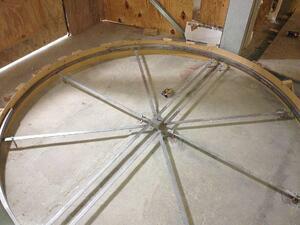 A floor frame is circular in shape and constructed of tubular bar stock that is 1 inch in diameter. 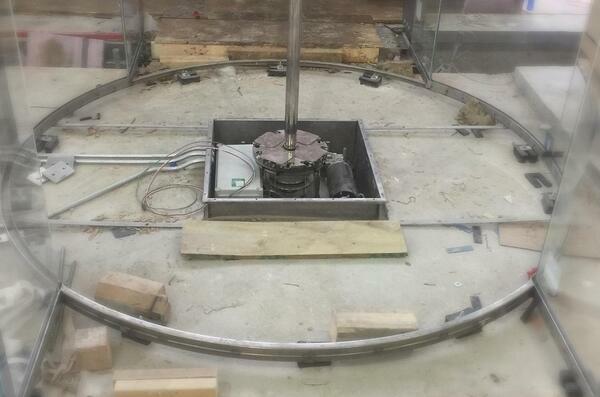 The bar stock is rolled out to the circumference of the revolving door. The finished frame is then set into a recess in the flooring that is a little bit more than 1 inch. Once installed, the frame should be level to the flooring around it. If using concrete or terrazzo, the flooring is poured in and around the floor frame, and then the revolving door is placed on top of the frame extrusions. Or, if using tile, carpet, etc., the flooring is laid inside the frame, then the door is placed. You are installing an all-glass revolving door that does not have steel framing. Floor frames are necessary to achieve a seamless, all-glass look. The floor frame has U-channels that serve as receptors for the curved glass of the revolving door, giving the appearance that the glass is sitting right on top of the floor without any door framing. You are installing the door’s electrical drive in the floor. Maybe you want an all-glass door or a door with a short canopy. In these cases, the revolving door’s electrical components need to be installed in the floor rather than the overhead canopy. And to accomplish this, a floor frame becomes necessary. Your flooring of choice is a stainless steel floor grill or pedimat. 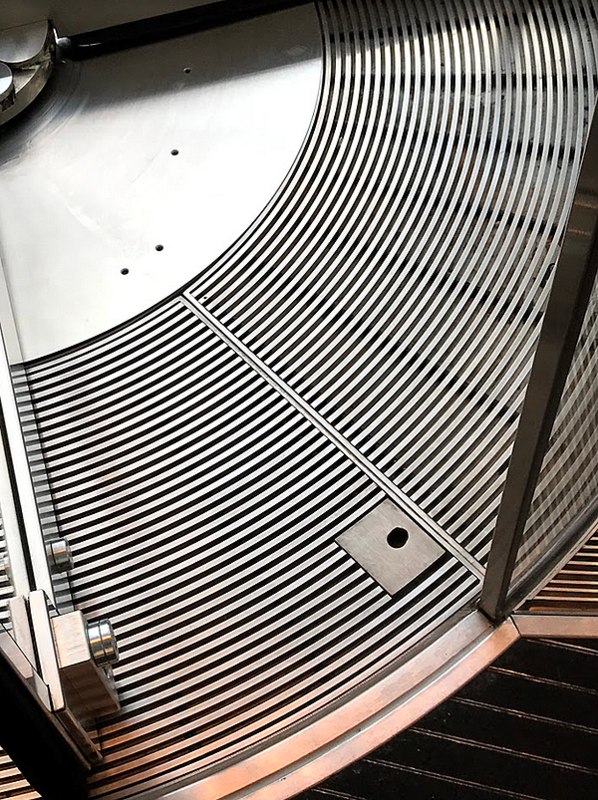 Floor grills and pedimats are designed to trap leaves, dirt and moisture before a person gets to the nice, clean lobby floors. However, a revolving door cannot be installed directly on top of these flooring materials. This is where the floor frame comes in handy. 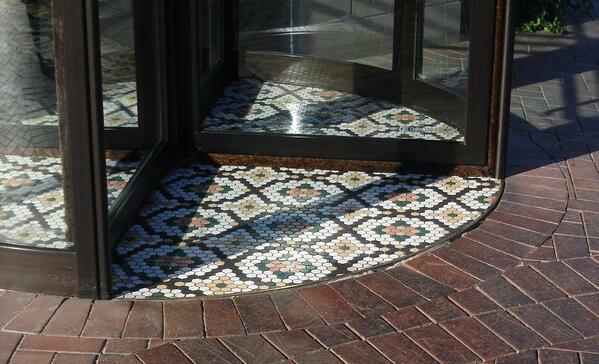 You are using a different flooring inside the circular area of the revolving door than the flooring surround. This flooring method is not only aesthetically pleasing, but it also helps the user know where to step inside the door. A floor frame can be used to create a neat transition with tight tolerances between the two different flooring materials. No unsightly grout lines or other transition strips. Terrazzo. Tile. Carpet. Grills. Pavers. Concrete. The flooring options are virtually endless. But, none of that matters to the success of a revolving door project if you make this most common mistake during the installation process: overlooking the importance of a dead-level floor and the benefits of a floor frame (or matwell ring). Each revolving door project is unique. I urge you to contact your local Boon Edam representative to discuss flooring at the front end of your project for years of success to come.